Series celebrating Japanese crafts. The Hamadas are a famous family of potters, and we see Tomoo at work, shaping his pots and firing them in a wood-fuelled kiln. 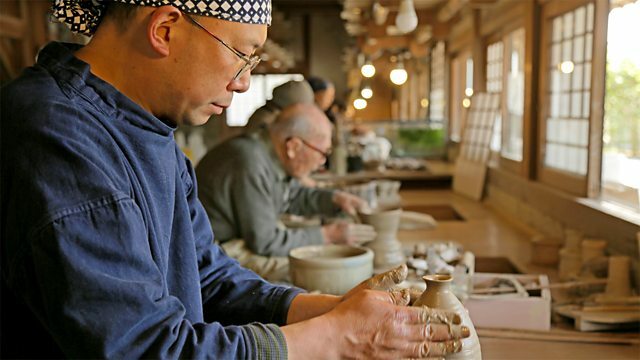 The final episode features one of Japan's most famous family of potters - the Hamadas. Shoji Hamada was a major figure in the Mingei folk art movement of the 1920s and '30s and helped turn the town of Mashiko into a major centre of ceramics, famous for its thick and rustic pottery. He also spent time in Britain where he taught renowned St Ives potter Bernard Leach the art of Japanese pottery. Today, his grandson Tomoo Hamada continues the family tradition and this film follows him at work, painstakingly shaping his pots and firing them in an old-style wood-fuelled kiln. We also hear how Tomoo played a vital role in saving Mashiko as a pottery centre after many of its kilns were destroyed in the 2011 earthquake.